CorporatePass is way to allow certain students to enrol online without having to pay up front. Instead their company (usually their employer) is sent the invoice. A password/code allows the student to bypass upfront payment and allow them to enrol in a set of limited classes or your entire range of classes. You can create as many CorporatePasses as you like for the same customer, and for as many different customers as you choose. You may have a large customer with a number of staff to whom you provide training. Without CorporatePass your choices are to have the staff enrol online with their own credit card or some corporate credit card, or to process the enrolments by hand in the office in conjunction with your customer's HR department. This involves a lot of co-ordination to check each student's availability. Instead, CorporatePass allows you to give the customer's HR department a password or set of passwords. They then hand them out to staff according to their own rules and policies. Staff can then enrol in whichever classes are most suitable to their own availability. Perhaps you are using onCourse to track internal training delivery in your company. You might want to assign a price to classes to help with interdepartmental cost allocation. CorporatePass gives you the ability to create a separate password for each department, allow staff to book their own training, and then perform the backend accounting you require. You deliver vocational training to the staff of several large mining companies. These staff need to be regularly accredited for some part of their job, but they have some flexibility to do their training around their work shifts. Students have to complete an audition or interview process to get into your programme of training. Once they are accepted, you would like them to be able to sign up to further training and tie their payments into a monthly billing process you already have in place. Just hand them a password and they can enrol 24 hours a day over the internet. There are several ways to prevent abuse of a CorporatePass. 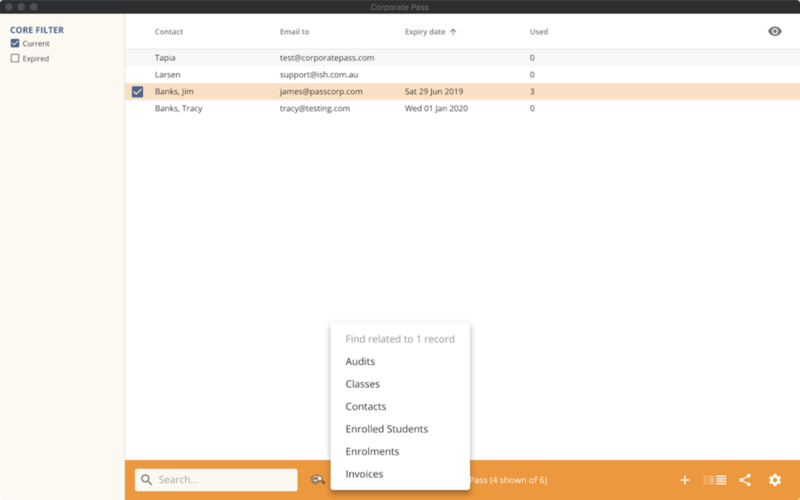 Each pass can be restricted to one class or a selection of classes, or classes assigned to a specific subject. Create as many passes as you want, even for the same customer. That way you can limit each pass in different ways and track its usage. Give the pass an expiry date. Each pass has a special email address to which an invoice will be sent for each enrolment. Typically this is your customer's HR department or staff manager who will be able to monitor the emails and ensure that staff are enrolling in appropriate training. These emails are sent in almost real time, so you typically have plenty of time to review and reject any extraneous enrolments. To create a new CorporatePass go to Financial > CorporatePass or click on the CorporatePass window within the Marketing Tab of the onCourse Client. You can then create a new CorporatePass by clicking on the + symbol in the top right hand corner of the new window. The minimum required information to create a new CorporatePass is a contact or Company Name and a Password. Remember that the Company or Contact must already exist as a record within onCourse prior to creating the CorporatePass. You can also specify as to which email address the invoices will be sent to. By default the email address of the contact will be applied. 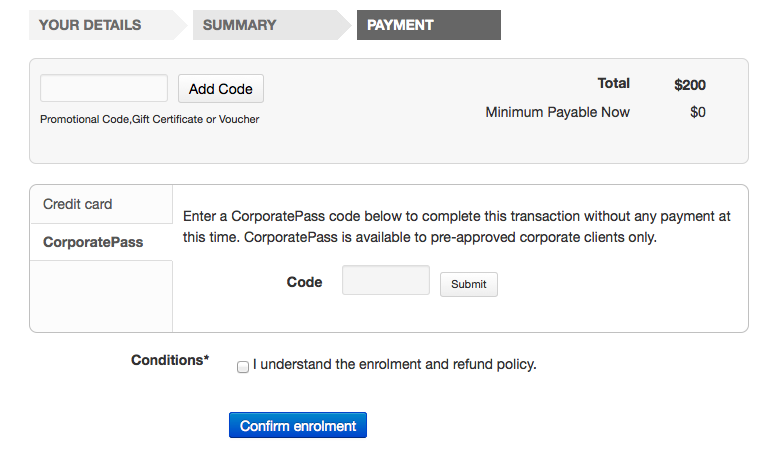 An expiry date can also be set for a given CorporatePass, but this is not a required field. If you wish to set invoicing terms for a specfic Corporate Pass, you can set this on the Financial tab of the Contact you have set as the company/person to invoice. 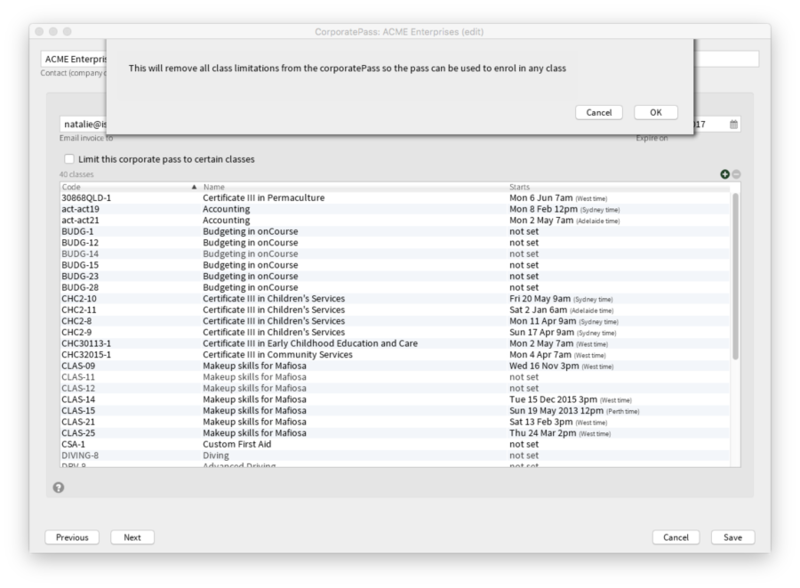 If you want to restrict the corporate pass to certain classes, you can add limitations. Please note if you want the pass to apply to ALL classes you should skip this step. Add a single class to a CorporatePass, this Pass will only be valid for the specified class. Add all classes for a given course to a CorporatePass. Add all classes for a given course. Add all classes from a given subject tag. If you don't specify any classes within your CorporatePass, this will mean that the Pass can be used to enrol in any classes that are open for enrolment and published on your website. If you choose to link your CorporatePass to all current and pending classes, this means it will only work for classes that exist today, not new classes you'll create in the future. This would be a very uncommon use case. If you uncheck the checkbox 'Limit this corporate pass to certain classes' you will get a message notifying you that by doing this it will remove all the listed classes linked to this Corporate Pass so this pass can be used to enrol in any class. 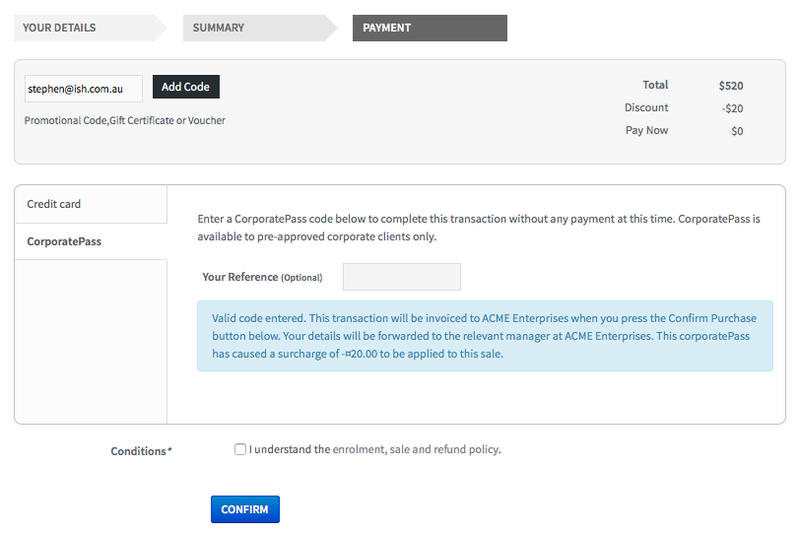 Instead of having to provide a company or person with a discount code that only they can use to enrol into a class with. You have the ability to link the discount or number of discounts to a Corporate Pass so employers or agents enrolling students can have access to a special price. 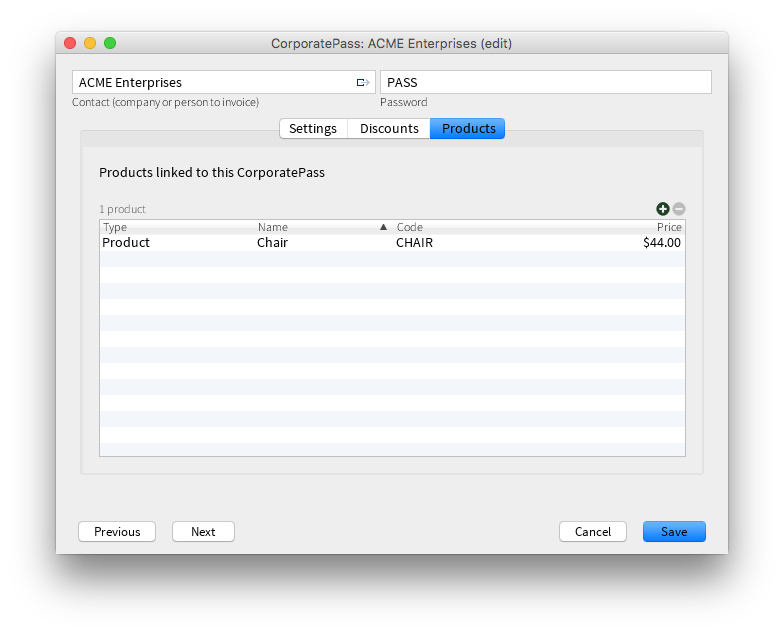 You can find the list of discounts linked to the Corporate Pass by clicking on the Discounts tab in the Corporate pass edit view. 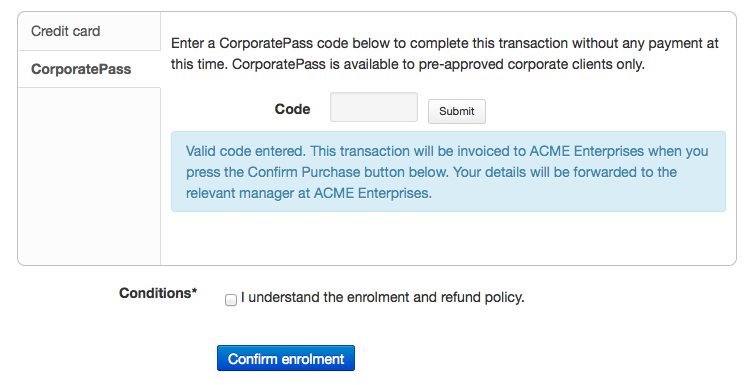 To link a new discount to a Corporate Pass you have to click on the '+' symbol in the top right side of the window. 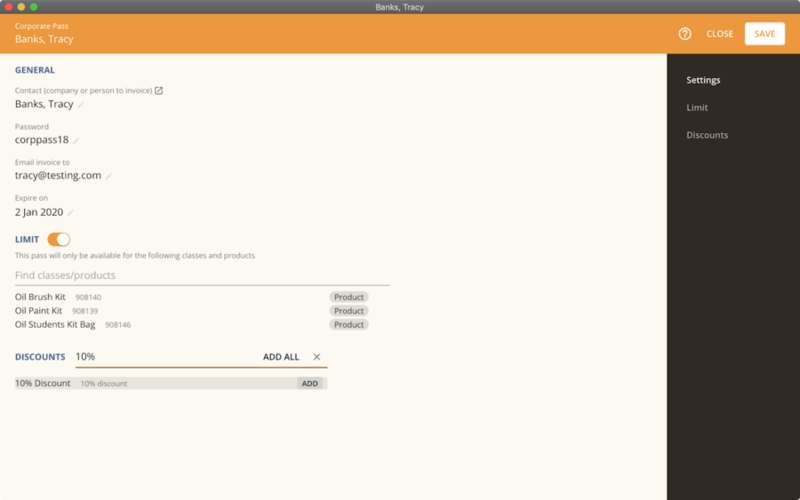 Then in the sheet that pops down you can search for discount you want to add. You can only link an existing discount to a Corporate Pass. If you want to add a new discount to a Corporate Pass you will need to go to the discounts list view and add in the discount you want to link the Corporate Pass to first. Corporate passes and their associated discounts can only be used during the online enrolment process. They aren't designed for use within Quick Enrol. If a discount has a promotional code and is available for use with a corporate pass you will get an error message if you try to use the promotional code in Quick Enrol. You also have the ability to link a product to a Corporate Pass. This feature allows you to link products, memberships and vouchers so that they can be purchased using a Corporate Pass. You can find the list of products linked to the Corporate Pass by clicking on the Products tab in the Corporate pass edit view. 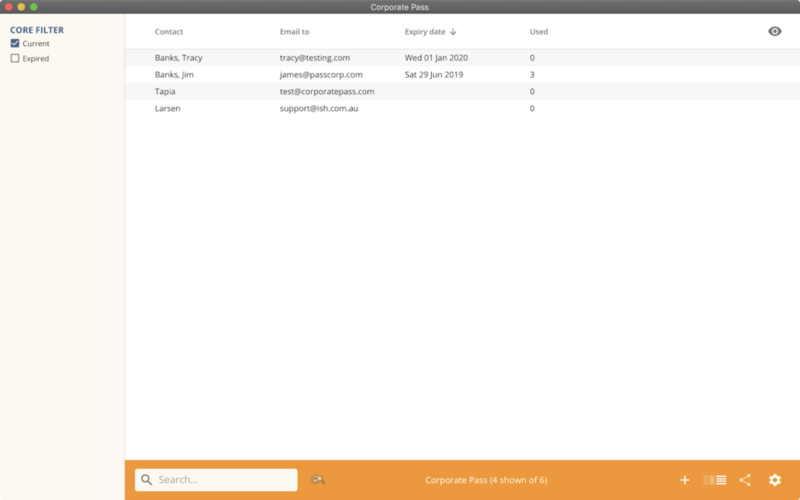 Just like on a lot of other list views you can use the find related feature in the cog wheel to find related information about a Corporate Pass or number of Corporate Passes. Once the CorporatePass has been created and the College notifies the client of the password for the CorporatePass, the client can then use the CorporatePass to enrol online. When the enrolment is confirmed and the CorporatePass has been validated, this will automatically send an enrolment confirmation email to the student and an invoice for payment to the designated Contact or Company that the CorporatePass has been issued to. The client will browse and select the Class or Classes they wish to enrol in, then proceed to the check out to complete the enrolment process. Once you proceed to the checkout, the onCourse website will ask you to confirm the contact details of the student as well as the Class or Classes that you wish to enrol in are correct, you can click on the Proceed to Payment button. 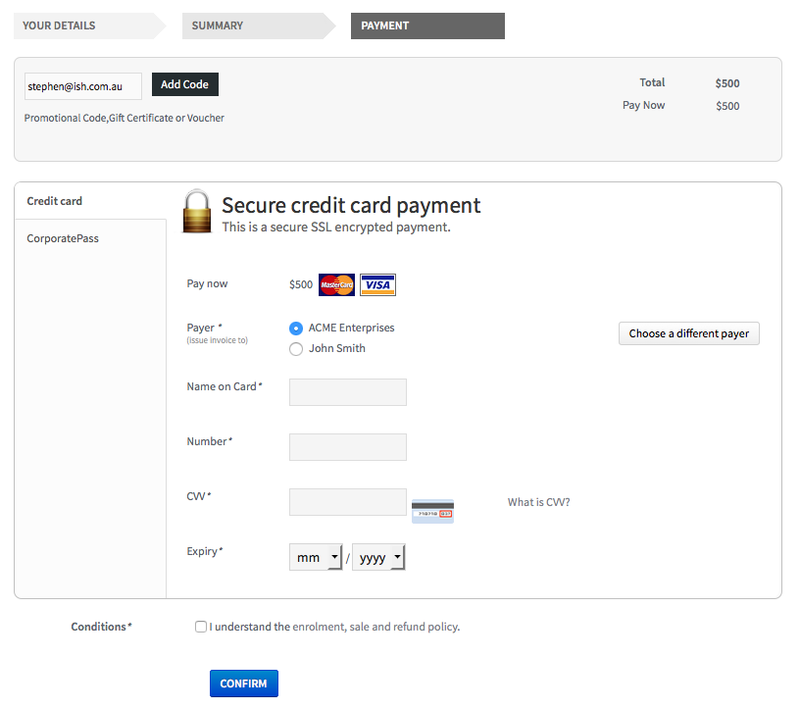 The payment view will you give you two options; pay by Credit Card or pay using a CorporatePass, simply select payment via CorporatePass. The system will then verify whether a valid code has been entered and specify as to whom will be invoiced for this Class Enrolment, you can then confirm you agree to the enrolment conditions and click on confirm enrolment to complete the process. 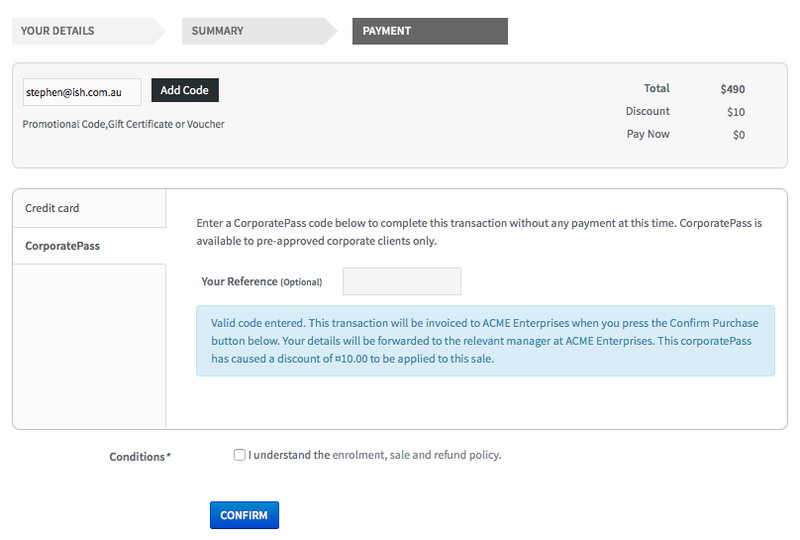 If a Corporate Pass is linked to a discount then the 'Total' at the top right side of the window will only get reduced or increased when the enrollee has entered the Corporate Pass reference. 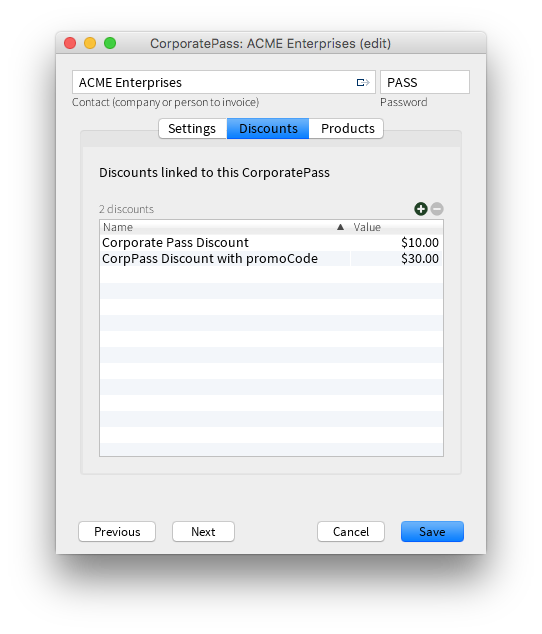 A Corporate Pass can also have a negative discount linked to it. This works exactly the same way as if a positive discount is linked one, however instead of the 'Total' getting decreased it gets increased, as shown below. If a Corporate Pass has both a positive and negative discount link to it, the negative discount always takes precedent over the positive one. Once the CorporatePass has been created, you can monitor the use of it via the Corporate Pass window of the onCourse Client. The list view will give you a heads up on how many times a given CorporatePass has been used. 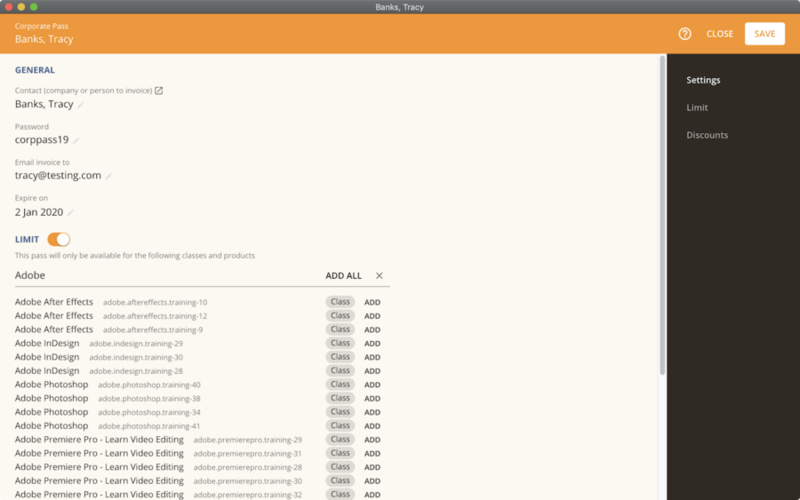 You can also filter the view to only show current entries using the Core Filter function of this window. 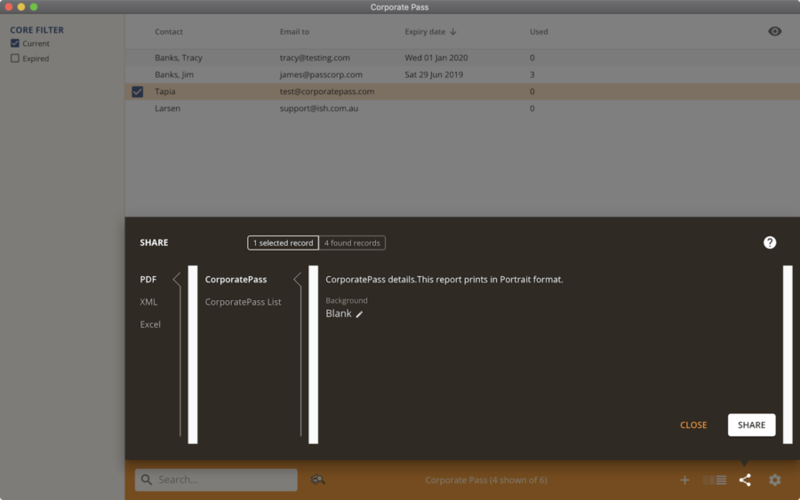 To view the details of a given CorporatePass, simply click on the hi-lighted record to open this up in edit view. From this view you can update the parameters of the Pass including valid expiry date and or assign different classes to the CorporatePass. Apart from utilizing the onCourse Client to monitor usage of your CorporatePasses, there are also several onCourse Reports available to help you monitor this aspect of your business. To access these reports simply highlight the records within the CorporatePass list view, then select File -> Printto open up the Report window.